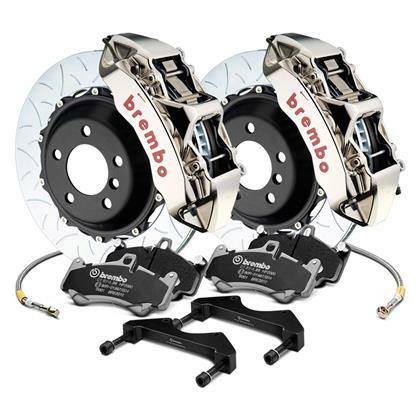 1M1.9014AR - Brembo GT-R Big Brake Kit - Lesher Motorsports, Inc.
GT-R is the most advanced expression of all Brembo’s experience in braking system design. The GT-R Kit is comprised of single block billet aluminium calipers with 4 and 6 piston radial attachment, two piece floating discs, pads with different friction material and high performance hardware. Single block calipers in billet aluminium with racing characteristics: lightweight, rigid and resistant to high temperatures. The GT-R calipers are made from billet aluminium with radial 4 and 6 piston attachments. They reduce the non suspended weight, improving the dynamics and vehicle performance. They are designed to provide a constant locking strength and the sensation of a stable and reliable pedal. The pistons with stainless steel radiators allow a significant reduction of heat passage during extreme driving, reducing brake wear to a minimum. In order to guarantee protection against corrosion and to provide high quality in the field, the GT-R calipers are nickel plated and have the Brembo logo CNC machined in red embossing. Two piece floating discs to reduce the suspended weight and dissipate heat quickly. GT-R braking systems include two piece floating discs which reduce the suspended weight and dissipate heat quickly. The floating disc’s anti-noise hardware is the direct result of Brembo’s experience with brakes designed for Formula 1 competition. The discs are available in sizes of 345 mm and 405 mm, 28 in diameter and 34 mm thick. The GT-R range offers a series of friction material which is able to meet a wide range of driving types. It offer optimum performance in various driving conditions, both on and off the track. In addition to the High Performance road pads, pads with racing/track friction material are also available. In order to guarantee correct installation without problems, the GT-R kit includes all the necessary hardware elements such as billet brackets and installation adaptors as well as stainless steel Goodridge brake pipes.